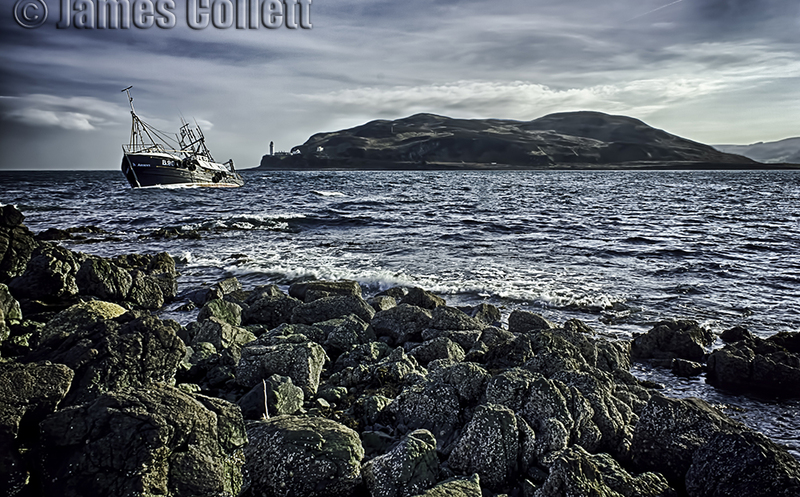 Here are excerpts from my memoir to go with James Collett’s excellent photo of a boat abandoned in Campbeltown Loch. To set the scene, I am 13 and am getting used to having a stepfather. An Irishman from Larne, Bill Moorhead had just married my mother, Chrissie Morrans. You might say that an abandoned boat in Campbeltown Loch helped to knit our relationship. Life was still not rosy for Mother even with her “new found respectability” as Bill turned out to be quite lazy. He would work for a little while, then complain that his heart was bad, quit the job that he had, and then lie around doing nothing for months. Then when he did work, he very often got drunk and gave her a lot of verbal abuse. He never did give my brother or me any trouble, though. I guess he knew better. He was pretty smart when he wanted to be. Quite often, he would reminisce about old times in Larne when he and others would make illicit whisky (“poteen” or homebrew). “Poteen boys” he called them. Then he would show me a photograph of a small motor boat that he said he had built himself during his younger days in Larne. I was so fed up hearing all that he did, that I eventually let it go in one ear and out the other. It seemed to me that all Irishmen bragged a lot about nothing! I don’t mean to suggest that we were enemies, though; mainly just the opposite. Bill taught me quite a few things, among them how to make netting needles that the local fishermen would buy to mend their nets and how to make the best catapult in town, one that was different from any I’ve ever seen, even today. (A catapult in Britain is called a slingshot in North America.) For all Bill’s faults, we got along very well. He certainly wasn’t dumb. He taught me things that I never would have learned if he hadn’t been around. I don’t know what my brother thought of him, for he never ever mentioned Bill to me either positively or negatively. (Actually, my brother never mentioned anything to me, period!) I think, perhaps Bill and Archie thought similarly of each other; and I don’t think it was complimentary either way. Regarding the catapult, Bill explained details like making a small hole in the centre of the leather pouch that holds the stone to reduce drag by letting air through while the stone was shooting forward. He taught me to reduce the “Y,” leaving just a stub on the bottom leg and cradling the other two legs with the thumb and forefinger. The securing system of joining the rubber to the leather was very elaborate, quite unusual with all the loops of leather that he used. It was actually quite easy to hit a tin can about ten meters (30 feet) away—impossible with the ones my friends and I had made previously. Best of all, Bill emphasized one very good rule: never shoot at any living thing! But, boy, did he ever fix it! You would never have known that it had been damaged, except for a little different shade where the new wood appeared. The boat was classified as “clinker-built” (overlapping boards). I never did watch him work on it and I’ve often regretted it. I thought he was just doing his usual bragging. I couldn’t believe it was the same little boat when he asked me to help him take it to the water. He had also managed, (how, I don’t know) to have two oars and two row locks (oar locks) and “hand-lines” so that we could use the boat right away, plus a rope to tie it up when we weren’t using it. Use it we did! We were never short of fish after that. It was only Bill and I who went fishing; my brother always said “no”, although he would certainly eat his share. We would go out in the evening, usually around seven or eight p.m., spend an hour or two at the most, and return home with cod, mackerel, or flounder. There was plenty of fish. In less than an hour, we usually had enough fish to last us a couple of days, plus some for Bill to sell. Bill shouted to me, “Get low in the boat, Ian, as low as you can and hold on to the sides.” He did the same. She missed us by no more than 40 or 50 feet (ca. 16 m.)! We bobbed up and down like a cork, oars in, as we clung for dear life to the edges of the little row boat. (There weren’t any rules about life jackets at that time, and we wouldn’t have been able to afford them anyway!) Bill knew to keep the centre of gravity as low as possible to help prevent capsizing; that was why he told me to get as low in the boat as possible. After that incident we made double sure that we checked if that ship was at her berth before we left to go fishing! We were at our usual spot between the island and the mainland (yes, the Shamara was already out! ), our lines were in the water and Bill had shown Mother what she was supposed to do. “Go down until the sinker touches bottom, Chrissie; then lift it just off, and then touch it down again ever so lightly so that the hooks are a few inches above the sand. That is where the cod are.” (Cod are “bottom-feeders.”). Well, I did go to help, and it took both of us to pull in this great big cod! (Keep in mind, we didn’t have rods; we used hand-lines and had to haul the dark, rough twine in with our bare hands.) We didn’t have a means of measuring the fish; in fact, no one ever thought of doing that in those days. The only indication we had was that the commercial “fish box” we always put our catch in was about 26 inches (65 cm.) long. (Every fish we had caught before always had fit inside the box.) As “Chrissie’s fish” was a full head and tail over the ends, it probably measured about 33 inches (84 cm.) or more long. That was some fish! This entry was posted in autobiographical story, Creative writing prompts, family heritage, Fishing, Inspirational story, memoir, Photography challenge, Reblogging, Scottish theme. Bookmark the permalink. I like this blog very much, Its a really nice spot to read and incur information. “If at first you don’t succeed, you’re running about average.” by M. H. Alderson. Thanks for writing. I try to update the site weekly but sometimes things get too busy to do it every week. We hope you will keep on checking out our posting, though. By all means, you have our permission to share with friends on twitter. Thanks for checking out our blog and for the kudos that it is well written. To address your concerns, we are laying out the content to the best of our abilities. The main focus is on sharing information on our published books and those other writings that we’ve done as well as future publications. For us, the text is the important thing and we only add images when we have some that relate directly or indirectly to the text being published. If you check further you’ll see that, in a previous blog post, we’ve shared all of the photos that were included in Ian’s memoir, “From Poverty to Poverty: A Scotsman Encounters Canada.” The other published books did not have images within the book so we’ve shared the cover illustrations and commented on them where appropriate. We realize that our blog perhaps shows up differently on different computer screens but are doing our best to present our blogs in a way that we find attractive and readable on our computer screen. We hope you’ll continue to follow our blog and perhaps even order one of Ian’s books in the future. Sorry to hear you are having trouble with hackers on WordPress. That hasn’t been our experience, except that WordPress does catch a lot of spam that comes in. I just label them as spam and delete them when I have time. It is annoying but I guess that is part of blogging. Perhaps you should address your concerns to the WordPress administration and they can help you overcome the problems. Best of luck. it looks good. I’ve bookmarked it in my google bookmarks.I found that it is really informative. I’ll be grateful if you continue this writing in the future. Many other folks will be benefited from your writing. Ian has just gotten up, read this and said “good job, but you spelled oxsters wrong. How would I know – I couldn’t find it in the dictionary. Great little memoir Ian. When were you home last? Thanks, James. This is Ian’s wife, Gayle, replying and I’m the one who does all of our blogging. Ian is in poor health and still in bed today, although it is late afternoon here. I try to do all the editing, publicizing and marketing for his books so am happy to find subjects such as your photos for which I can blog a writing reference. To answer your question, Ian was last in Campbeltown in 2000 when he and his late wife Mary went back to Scotland shortly after Ian retired. They wanted to see what the old country was like and explore whether they might like to move back full time. Well, they determined that they couldn’t afford to live in Scotland on their retirement income and that they would miss their children and grandchildren in Canada too much. So, after some pleasant visits with family and old friends, they returned to Canada but to Nova Scotia that time so they could get a bit of both Canadian and Scottish cultures. That lasted only a few years, though, as Mary was too lonesome for the family; so she flew back to Winnipeg to stay with their daughter’s family and Ian followed some months later after their house sold. She only lived a week longer after he returned to Winnipeg. The following year I came into the picture, having been widowed for seven years already. My maiden name was Scottish and I knew only that my Moore great-grandparents had emigrated to Canada in the late 1800s from Edinburgh and that my grandfather was born in Ontario and emigrated in his early 20s to the USA. Ian has done a very good job of making a true Scottish affectionato out of me. Now I understand words such as “ochsters” and “pealy-wally” and can sing a mean Scottish folk tune with an almost proper highland accent. Unfortunately, I can’t speak like a Scot. Ian says, “It’s gan fine.” We’ll keep watching for more photos of Campbeltown and environs.